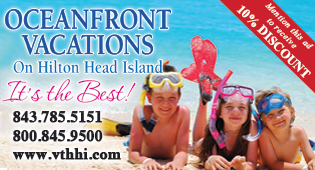 In case you haven’t heard, Tuesday is the new Friday on Hilton Head Island. If you don’t believe it, simply make your way to Shelter Cove Harbour & Marina around 6 p.m., any Tuesday between now and August 15. People of all ages will be laughing, singing, dancing, marveling at the sunset, taking selfies, getting happy and celebrating as if there is no tomorrow. Set among a stunning array of Mediterranean-style shops and restaurants and basking in the glow of the island’s most glorious sunsets, HarbourFest is a multi-generational, family-friendly waterfront festival, featuring live music, arts and crafts, face painting, balloon animals, bounce houses, train rides, and a variety of interactive games and activities—topped off with fireworks at dusk to end the evening with a bang. Familiar characters on hand include singer/songwriter Shannon Tanner, Cappy the Clown, the Mermaid of Hilton Head, the golf teaching pros from Palmetto Dunes, and Steel the Show steel drum player Melvin Dean. 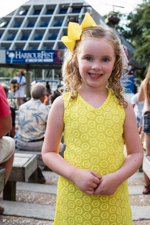 Beloved by locals and visitors alike, now in its twenty-ninth year, HarbourFest is the largest multi-week event on Hilton Head Island, drawing over 60,000 people over the course of the summer season. 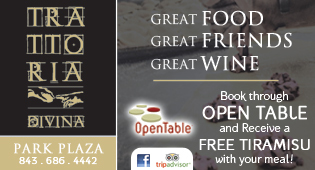 The event takes place from 6-10 p.m. each Tuesday, with popular family entertainer Shannon Tanner taking the stage at 6:30 and 8 p.m. Fireworks begin at dusk. 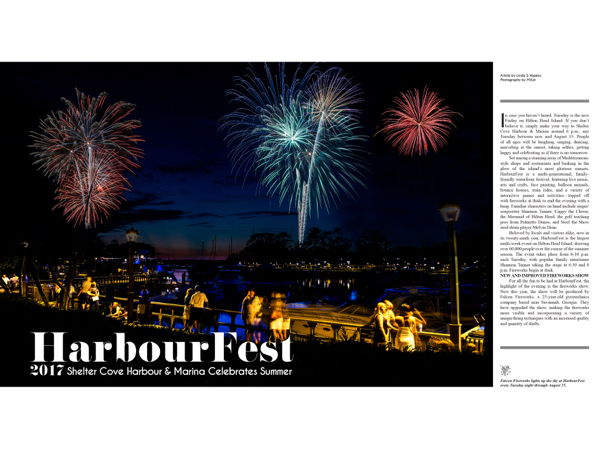 For all the fun to be had at HarbourFest, the highlight of the evening is the fireworks show. New this year, the show will be produced by Falcon Fireworks, a 25-year-old pyrotechnics company based near Savannah, Georgia. They have upgraded the show, making the fireworks more visible and incorporating a variety of unique firing techniques with an increased quality and quantity of shells. 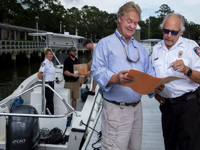 Falcon Fireworks Owner, Brent Fisher, goes over safety protocol with Hilton Head Island Fire and Rescue Senior Fire Inspector Sam Burnett while fellow Fire Inspector Danielle Tison supervises the safe loading of explosives for Tuesday night’s fireworks show at Shelter Cove Harbour and Marina. 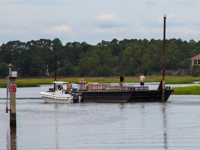 The Falcon Fireworks team heads out to the fireworks barge located on Broad Creek. Brent Fisher, owner of Falcon Fireworks, watches his crew safely navigate towards the barge from a dock in Shelter Cove Marina. The company is based near Savannah, GA and has been successfully lighting up the skies for special events for over 25 years. 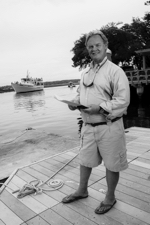 For safety reasons, the Tuesday night show at Shelter Cove Harbour is launched from a barge in Broad Creek outside of the marina and controlled from a distance by computer. Many people are surprised by the complexity of an organized, public fireworks display. It’s not the same as shooting a few firecrackers in a field. 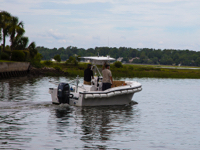 For safety reasons, the Tuesday night show at Shelter Cove Harbour is launched from a barge in Broad Creek outside of the marina and controlled from a distance by computer. Setting up takes a crew of four technicians and a driver. “Everything has to be trucked in with a DOT HAZMAT [hazardous materials] licensed driver,” said Falcon Fireworks owner Brent Fisher. To be ready to shoot by nightfall, setup begins around 1 p.m. “A lot of pieces have to fall into place correctly to put on a successful show,” Fisher said. “It’s actually a lot of physically hard work, but we keep the focus on what it’s all about: entertaining families and children.” After the show is over, the crew is on site another couple of hours to make sure the barge is safe to leave. Fisher’s goal is to take audiences on an emotional adventure. “We do it with a varying number of colors and effects. I don’t want any dark sky. I want something happening all the time. It’s more choreography, artistry and design than how many shells we shoot,” he said. A young Shannon Tanner fan dressed to the nines, waits patiently for the 8:00 p.m. show. Cappy the Clown delights kids of all ages with face-painting. You can find Cappy Monday-Friday night between the bounce houses and the pavilion where Shannon Tanner performs. 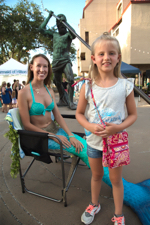 New this year, the Mermaid of Hilton Head (Nina Leipold) brings the legendary aquatic creature to life, posing for photographs and signing copies of her children’s books. 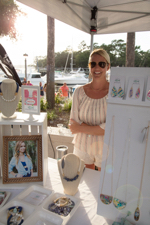 Stop by and meet Lissy Rawl of the little fish BOATEAK and fall in love with her handcrafted jewelry, combining a coastal feel with a classic sophistication that can be worn for a day on the water or a night on the town. 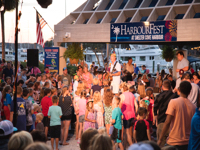 • In addition to Tuesday night HarbourFest, Shannon Tanner performs his family show Monday, Wednesday and Friday at 6:30 and 8 p.m., now through September 3. 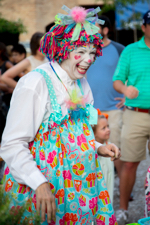 • Cappy the Clown will be on hand Monday-Friday from 6-9 p.m., weeknights until September 3. • On Thursday nights, Shelter Cove Harbour turns into a Caribbean paradise, celebrating “Parrot Palooza,” with Shannon Tanner & the Oyster Reefers performing a Jimmy Buffet Tribute Show from 7-9 p.m. through August 17. • Seasonal nightly entertainment is available at select Shelter Cove Harbour restaurants throughout the summer. All events are weather-permitting and subject to change. 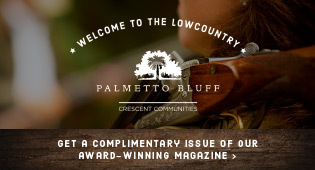 For more information, visit palmettodunes.com or call (888) 857-7221. For the Fourth of July show only, in addition to the parking lots at Shelter Cove Harbour & Marina, shuttle parking will be available at the Hargray parking lot along Hwy. 278 and at Chaplin Park off Singleton Beach Rd. (see map below). Shuttles will run continuously from 5-11 p.m. Throughout the summer, Palmetto Dunes Resort guests can avoid parking altogether by hitching a ride on the Dunes Buggy. Buggies are dispatched on a first-come, first-served basis, usually within 10 minutes of your call. (Waits may be longer on Fourth of July.) 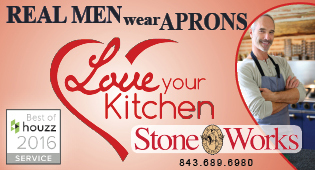 For a free ride, call (843) 689-4222.